When it comes to your swing doors, one size definitely does not fit all. This is why it's so important to consider the requirements of your doors - so that you can select one that best suits your application. After all, a product that seems to be the least expensive can end up being very costly in the long run if you apply it incorrectly. 1. What your business does. Remember that where you place them in your business is equally as important. They will have different requirements depending on whether they will be placed on a cooler box, loading dock, manufacturing area, or store room. 2. What traffic goes through the opening. You need to look for swing doors that are the right size to cope with the traffic that will go through it, and how often they will go through it. You may have specific temperature requirements that your swing doors need to satisfy. For example, you may need insulation between airconditioned or heated areas. Consider whether your doors will have to deal with high moisture or humidity, and whether they will be subjected to full washdown during cleaning. This will significantly impact the durability of your doors. 4. The level of visibility needed. Consider whether you want your doors to stand out, or blend into the background. In some cases, like in a restaurant, you need the door to match a specific decor. However, this is unacceptable for warehouses, where visibility of the door is extremely important. A door with high visibility can help reduce forklift collisions, which not only puts staff safety at risk but also increases maintenance costs. 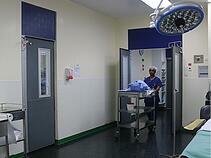 You may need a set of doors with specific compliance certifications. Remember to ask your manufacturer for this kind of information when you have narrowed down your selection. 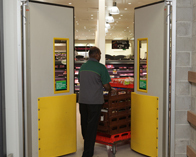 Once you have gained clarity around your requirements, then look for swing doors that suit your application. 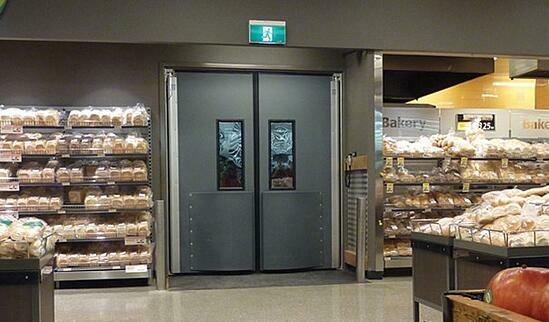 We offer a variety of swing doors across a range of industries.